The term General Fund Budget refers to the expenditures and revenues associated with the delivery of services by county agencies funded with several different revenue sources. Services provided under the general fund include juvenile detention center operations, tax office operations, justice courts, sheriff’s office, and emergency services, to name a few. Go to the Budget Office Home Page. 1. What is the purpose of the county budget? The budget is an annual financial plan for Brazos County Government. It specifies the level of county services to be provided in the coming year and the resources, including personnel positions, capital expenditures, and operating expenses needed to provide these services. It reflects the policies and priorities set by Commissioners Court. 2. What is the difference between the operating budget and the capital budget? The operating budget provides funding for the day-to-day operation of the county. It includes the operation of county buildings and facilities, salaries for county employees, and many of the services available to citizens. The capital budget provides funding for the construction of roads, bridges, buildings, and other pieces of the infrastructure. These are onetime costs rather than recurring costs. 3. What does General Fund Budget mean? 4. Where does the county get its revenue for the operating budget? A fiscal year is a 12-month operating cycle that comprises a budget and financial reporting period. 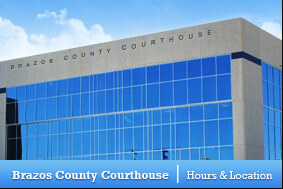 Brazos County’s budget is based on an annual fiscal year that starts October 1st and runs through September 30th. 6. What is the current property tax rate for Brazos County?